Eggs generally contain similar amounts or less saturated fat per serving compared to other animal protein foods. For example, a large whole egg (50g) contains almost half the amount of saturated fat than a roasted chicken thigh (60g). The egg yolk contains the majority of fat and calories – 54 calories (226kJ), 4,5g total fat and 1,6g saturated fat (large egg) – while the egg white is lower in calories, contains almost no fat and is high in protein: 16 calories (66kJ), 0,1g fat and 3,6g protein (large egg). Individuals who wish to lower their intake of total and saturated fats can substitute egg whites for egg yolks in scrambled eggs, omelettes and recipes that require eggs. For the flatbread, preheat the oven to 230˚C. Line a baking sheet with baking paper. Set aside until needed. Combine the chickpea flour, psyllium husk powder, baking powder, salt and crushed cumin seeds together in a bowl. Whisk to remove any lumps. Add the water and stir until well combined. Set aside to rest for 5 minutes before stirring again. The aim is to create a thick, wet mixture that is similar to cake batter. Pour the mixture into the prepared baking sheet. Use an offset spatula to spread the mixture into an oval shape of about 1,5cm in thickness. Bake in the preheated oven until crisp, about 5 minutes. Remove from oven and set aside to cool slightly. For the yoghurt, combine all of the yoghurt ingredients in a serving bowl. Set aside until needed. To assemble, spread a layer of the yoghurt over the surface of the flatbread. 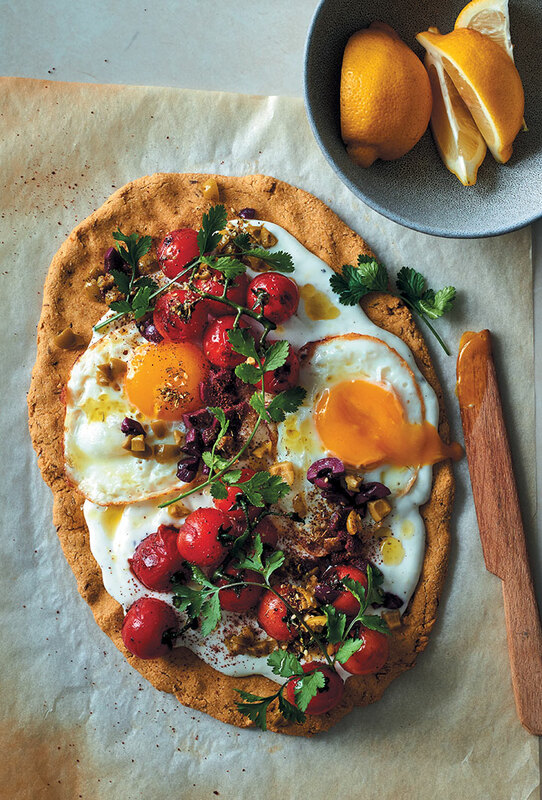 Top with the fried eggs, chargrilled vine tomatoes, fresh coriander leaves, and chopped green and black olives. Sprinkle with the sumac and za’atar, and drizzle with the olive oil. Serve with the lemon wedges alongside, for squeezing.